Take a scenic and breathtaking 1.5 hour hike hike in the mountains towards the Pond de Dieu. After the dam, the path lies on the right side of the river and goes up the hill quite steep. The bridge was formed by the river floating underground and carving its way over millenia. There seems also be a way down at the river, so one can see the bridge from below. Don’t try this in spring though, as after snow-melt or rain the river may be unpassable. To left over the river starts a path towards the cascades. Start out early to enjoy an afternoon hike in Akchour. It is a scenic drive getting there and great for weekend hiking trip. 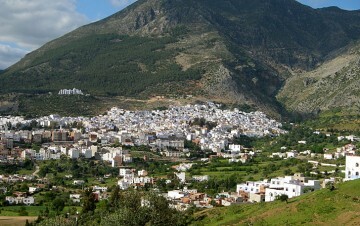 A strenuous hike up Jebel al-Kalaa (the peak immediately overlooking Chefchaouen) is fun, but can take up to 9 hours round trip and goes by (and if you’re lucky/unlucky, through) big marijuana plantations. The route is not well marked (with white and yellow), and you might have to trail blaze for parts of it if you lose the trail. Start by following the road up the southeastern valley, from where you’ll get a good view of town, and look for the markings up the mountain. Bring plenty of water, and some snacks. 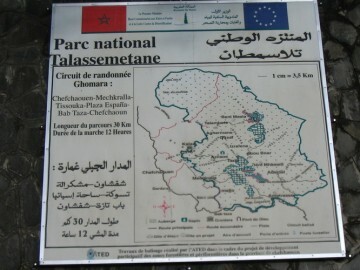 A two-day hike in the Talasemtane national park via Asilane (Gite, 200 Dh per person incl. meals) to Akchour also starts up the big mountain on a 4WD track which goes of in the north of Chefchaouen just after the camping site. At the peak at about 1800m is a camping site. Be advised though that there maybe snow even until April, so be prepared for cold temperatures. There are at least two water sources on the way up, so you’ll not need to carry too much water. It’s about 14km until the gite in Asilane. The 4WD track continues until the next village from where one has to cross over a small valley, continue straight after passing a tomb-house and climb down the small path to the village of Inezgane. 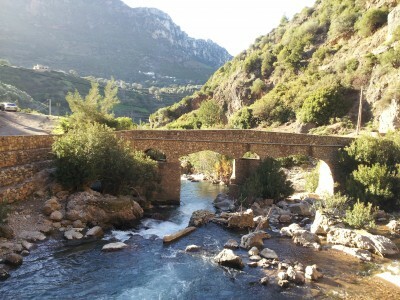 From there, a mule trek follows the river more or less closely and the gorgeous mountains, cliffs and breathtaking views. After a while the path goes down to the river over an ancient bridge and continues north, passing a source (although this one might dry up in summer) and eventually leads to the village of Akchour which has another Gite, but also cheaper accommodation.